A new study commissioned by Zero Waste Europe finds majority of product waste not covered by current Extended Producer Responsibility (EPR) schemes and calls for redesigning it in order to move towards a circular economy. Key findings from the new study covering 15 European cities have been published today , in advance of the publication of the full study in September. The study shows that 70% of municipal solid waste is product waste (waste that is not food or garden waste) and as such could be included under an EPR scheme. However currently only 45% of this product waste (by weight) is covered by the producer responsibility scheme. Furthermore, only 18% of product waste is collected separately through an EPR scheme. The full study to be released in September will make a series of recommendations to the European Commission. Among these it will call for a broader definition and a more comprehensive approach to EPR which includes the use of economic instruments. The introduction of legally binding eco-design requirements as well as better EPR schemes with full-cost coverage, individualisation, targets for separate collection and the expansion of the current EPR scope to include more products. Zero Waste Europe encourages the European Commission to take these findings into account in the up-coming proposal on the waste package which will be presented before the end of the year. 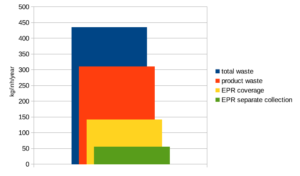 Figure 1: summary of total waste, product waste, EPR coverage and EPR separate collection.